I have been retired from teaching for four years and have been so blessed having had a wonderful career and family. I was looking for a way to give back. 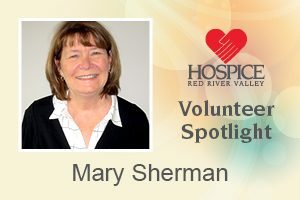 Last fall my mother-in-law started receiving services from Hospice of the Red River Valley. I was impressed by the organization and knew immediately that this was the right fit for me. I have been a knitter for most of my life. I love to read and am a member of a fantastic book club. I also do watercolor and adore traveling. Every year my husband and I spend a month in Sacramento with our son and his family. It has a very Midwestern feel for a California city, and the weather is great. Other than that we are explorers and love to learn about new countries and diverse cultures.